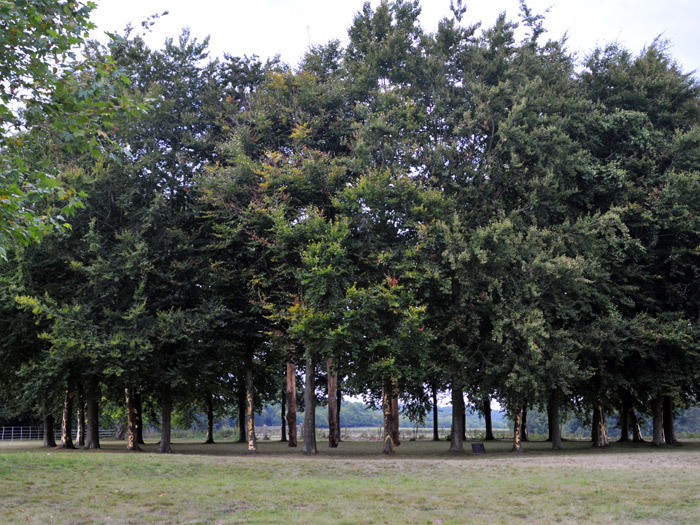 artSOUTH provided a welcome opportunity to make Resuscitare for Mottisfont, a new site-specific installation in the grounds of Mottisfont, within an existing beech tree circle in the gardens next to the house. This particular site resonates significantly with Elpida’s existing practice, and it has been an ambition of hers for some time to make a work here. Collaborating on and sharing the creative process with staff and volunteers at Mottisfont has brought a very exciting new dimension to Elpida’s working practice, in particular surrendering the selection of Whister’s original designs, for reproduction on the trees, to the fantastic conservation people. Elpida has relocated five fallen trees from the wider estate to give them a new life. 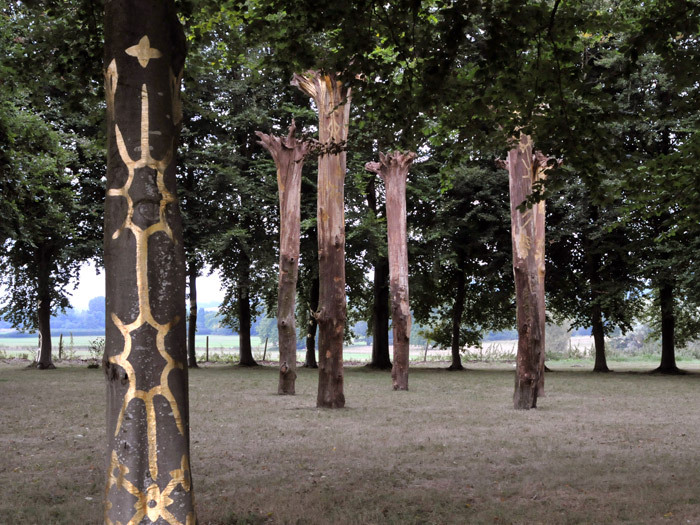 The living trees are gilded with Dutch metal and the fallen trees are gilded with 23.5 ct gold. As the beech circle trees lose their leaves through the autumn, so the installation will be further revealed. The Dutch metal will change color, decay and disappear with time (also suggesting the work has been here far longer); where as the gold gilding on the dead trees will retain it’s lustre. The project would not have happened without the knowledge and experience of John Surplice (who worked as a forester for 34 years at Mottisfont), the collaboration of the House Conservation Team on the design and gilding and the management of the installation process by the Countryside and Gardens Teams. Mottisfont is a beautiful house and garden near Romsey, full of history; the house is crafted from a medieval priory and well known for its celebrated rose garden and ancient trees. Resuscitare has been very popular with the public and the National Trust have decide to keep the work to be enjoyed for longer. More information about the project and location maps could be found on the artSOUTH website.